I am excited to catch the latest release of Harry Potter and the Half-Blood Prince which open tomorrow in local theaters. To be honest, I am more excited for this movie instead of Transformers: Revenge of the Fallen. That's partly because I read all of the Harry Potter series. Thank to NECA, we have some decent looking Harry Potter movie figures and the latest series of figures are getting more and more good looking. 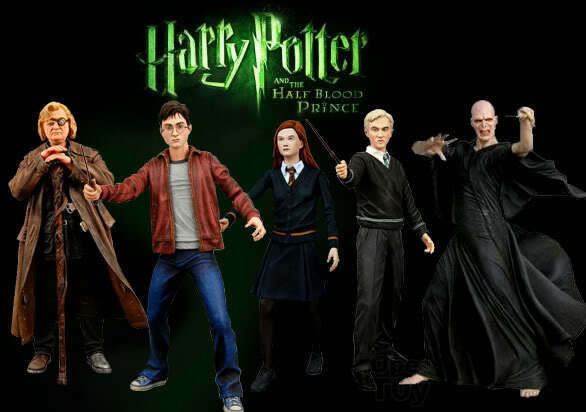 There are currently 5 figures including Harry Potter (In Cave Scene Outfit), Ginny Weasley, Draco Malfoy, Mad-Eye Moody and Lord Voldemort. 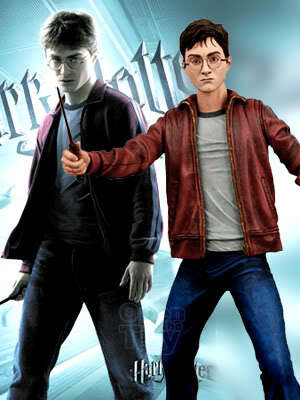 The likeness of Harry is there for the prototype, just take a look for yourself. I just hope that actual toy look as good as it is on the picture. By the way, where's Prof Dumbledore? He played an important part especially this installment and he is going to ... Better not expose any spoiler here but then again so many have read finished the story...So that won't be a spoiler right? LOL I saw the making of Half blood prince and they will be more romance, teenage issues and love potion. Okay that is a spoiler. Any Harry Potter fan going to catch this movie? I know I will. Expecto Patronum!!! I'm going to see it tomorrow. Can't wait! The toys are out and you can get it at CSC. However they sell in a set so cant choose. I soooo want Mad-Eye Moody...I am collecting the witches and wizards from NECA! I did blog about them sometime back! I planned to watch on this coming Friday.. I think the ground floor Treasure Island i think sell some separate ones. It was really good! It's too bad they're not making a Luna Lovegood figure, too. You are so right Mario. I would pick Luna lovegood up if NECA actually do a decent figure of her. Come to think of it, Luna was not even made in the Order of the Phoenix lines!!! Leave it to NECA to make some decent six inch movie figures!